The Stanley ride is amazingly comfortable; perhaps from a vibration and comfort level in the seat equal to many of today's cars. This is often hard for folks to comprehend for a vehicle using turn-of-the-last-century technology. There are no shock absorbers on the suspension and only elliptical leaf springs to cushion the body from the axles. However the construction of the seats and the use of very compliant coil springs along with ample horsehair padding absorb every nuance of road irregularity. The ride is surprisingly comfortable. While the car was away undergoing a full body restoration the seats were carefully disassembled, reconditioned, and then reassembled reusing only the original box spring. 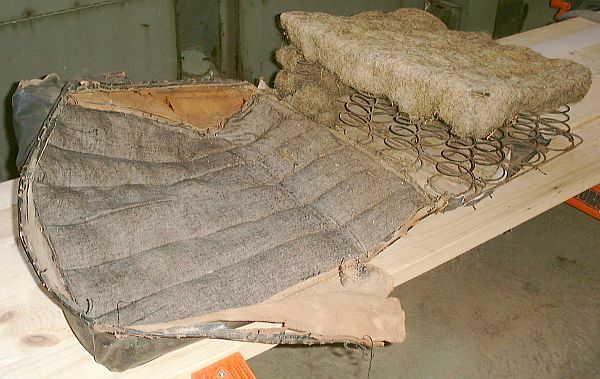 The photograph above shows an inverted front seat cushion being disassembled with the heavy canvas covering the bottom of the cushion cut loose from the leather sides to gain access to the interior. The coil spring unit is plainly visible. The rear bench seat cushion is of identical construction with the only difference being a longer width unit. Two front seat cushions were provided for easier access to the pilot fuel and steam cylinder oil tanks which were located under the front seat (talk about sitting on a bomb ~ the pilot fuel tank is full of gasoline under 30 PSIG pressure!). The seat's leather covering has been folded open in the above photograph as the seat sits like it would in the vehicle with the front face of the seat to the left. 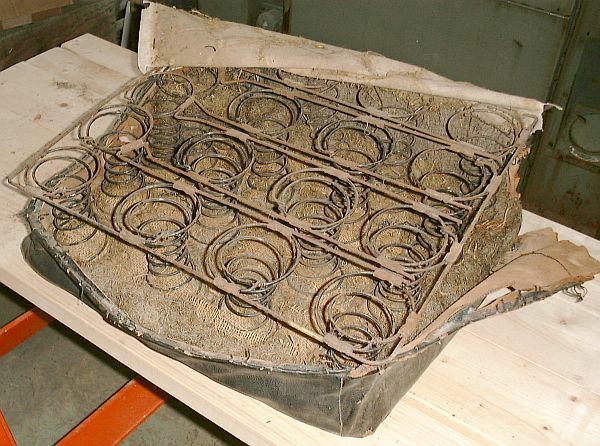 The springs were covered with a thin layer of jute or hemp batting to provide some protection between the spring wire and the leather covering stuffed with horsehair. The leather right and left sides of the seat were not padded, however the seat front and seat top had a heavy canvas liner sewn on at a 3-1/2" spacing and the voids were stuffed with horsehair. In the photograph above the canvas backing of the leather seat cover has been sliced open between the rows were it is sewn to the leather. Opening the slit allowed easy access to the horsehair filling which was lifted out for reuse. The horsehair filling had become matted over time so that each cavity's filling could be lifted out nearly intact. 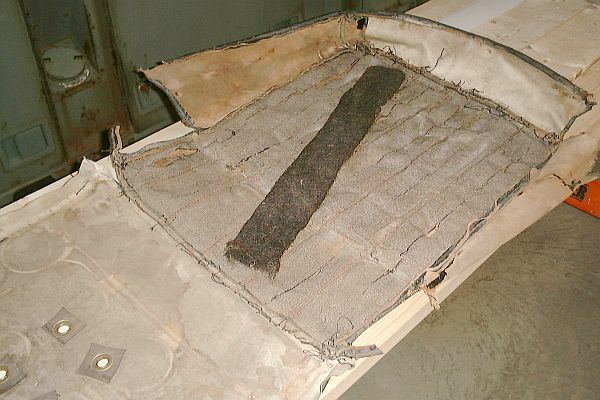 One of the horsehair filling strips lays across the seat cover. The strips were placed in plastic trash bags for storage. Later on each strip was pulled apart and the horsehair fluffed back up. After 80+ years the horsehair still had a springy characteristic and could be reused. With the seat cover removed access to the box spring was possible. Years of use had bent the wire frame out of its original shape. Generally chair springs are tied together using a jute or hemp cord with either a 4-way or an 8-way tie. Stanley seat cushions used chain to interconnect some of the coil springs. As many of the chains had rusted or pulled loose, all chains were replaced with new chain. The rear edge of the spring unit is not as high as the front edge of the unit. This was intentionally done so that the cushion, when positioned in the car, would taper towards the seat back making the seat more comfortable. The spring assembly is positioned so that the front is facing the lower left corner of the photo. Careful examination will reveal that the spring unit's top surface has the right and left edge springs as well as the front edge springs all secured to a metal frame. There is a group of six springs at the center back of the unit that are not connected to a wire frame. 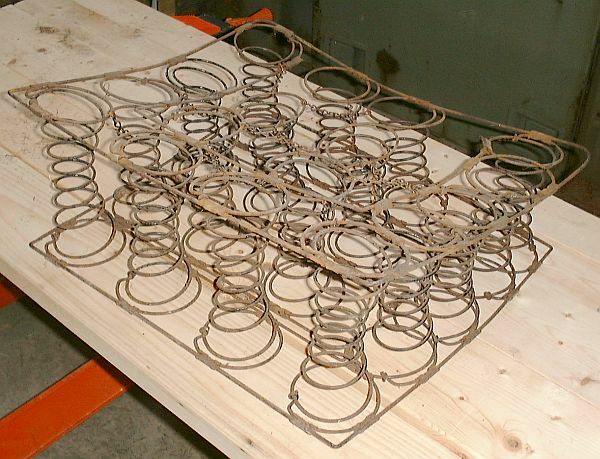 These springs are interconnected and held in place with the chains. This configuration made the seat more comfortable and compliant under a person's buttocks but more firm around the edges. Careful examination of the manner in which the springs are positioned reveals four rows of springs running front to back on the spring assembly. However one row (the one closest to the lower right corner running from bottom center to right center) has five springs in the row. The reason for the additional spring and tighter spring placement is because this is the door side of the cushion. Because of sliding in and out of the seat when entering and exiting the car the outside edge of both front seat cushions contained an extra spring. The box spring units had all of the chains between springs replaced. The wire frames were straightened and sprayed with flat black paint to inhibit further rusting.